Kathy and ALD were recently featured in an article for the Providence Journal! 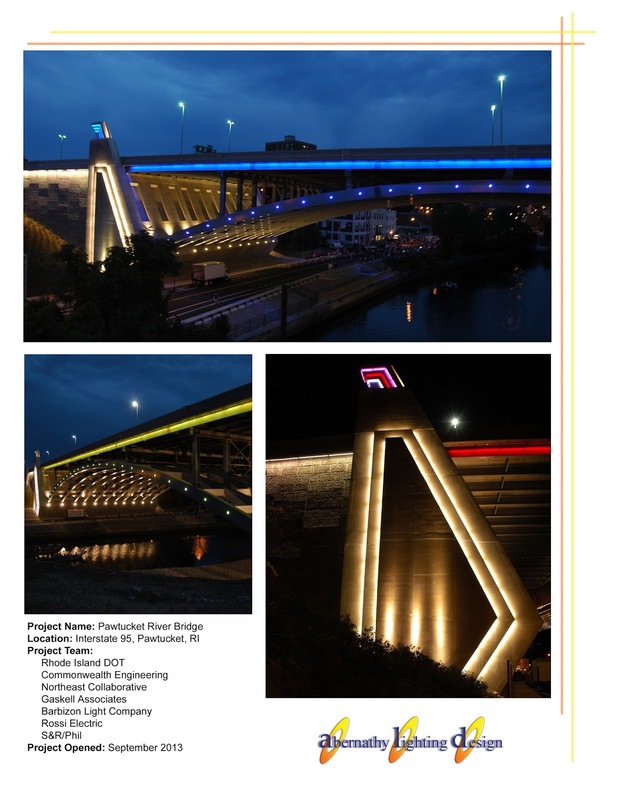 The article, by Andy Smith, discussed our recent design for the Route 95 bridge in Pawtucket. NORTH PROVIDENCE — At Christmas, the bridge will glow red and green. For July 4, it will be red, white and blue. And on St. Patrick’s Day, of course, it will be green. 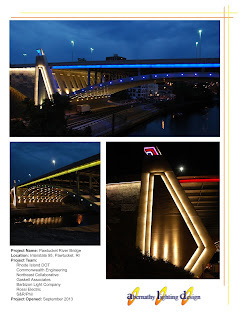 The wizard behind this holiday color on the new Pawtucket River Bridge is Katherine Abernathy, a lighting designer based in North Providence who has illuminated everything from Ferrari World in Abu Dhabi to the Jimmy Carter Presidential Library and Museum in Georgia. Abernathy said she and her colleague Jason J. Rainone have been working on the bridge lighting since 2008, meeting with representatives of the state Department of Transportation, the City of Pawtucket, Northeast Collaborative Architects (formerly Newport Collaborative Architects), Commonwealth Engineers & Consultants, and electrical engineers Gaskell Associates. She said she can’t remember who first came up with the idea of the bridge lights changing colors. 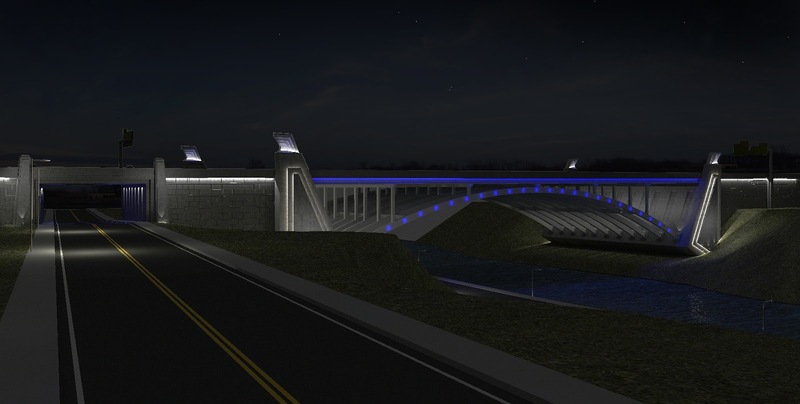 In Abernathy’s design, metal-halide and LED (light emitting diode) lights provide white light for the pylons at each end of the bridge, the bridge approaches and the underside of the structure. 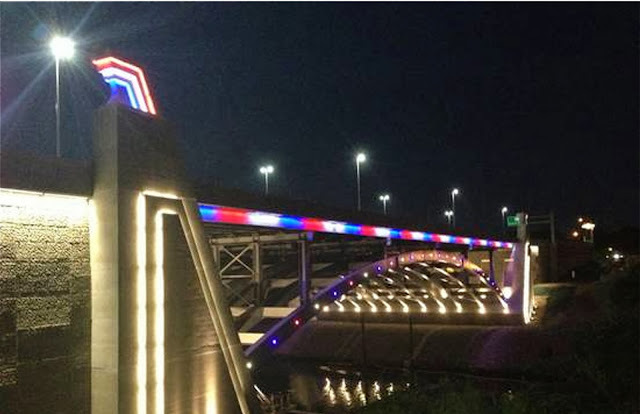 Colored LED lights are used within the Art Deco eagle wings that guard each end of the bridge, with small round lights outlining the curve of the central arch. A single band of light runs along the main span. The colored lights, capable of 16 million color possibilities, are controlled by a computer that can be programmed for the entire year. To read the full article, check out the PROJO's website! ALD now has WBE status nationwide!! 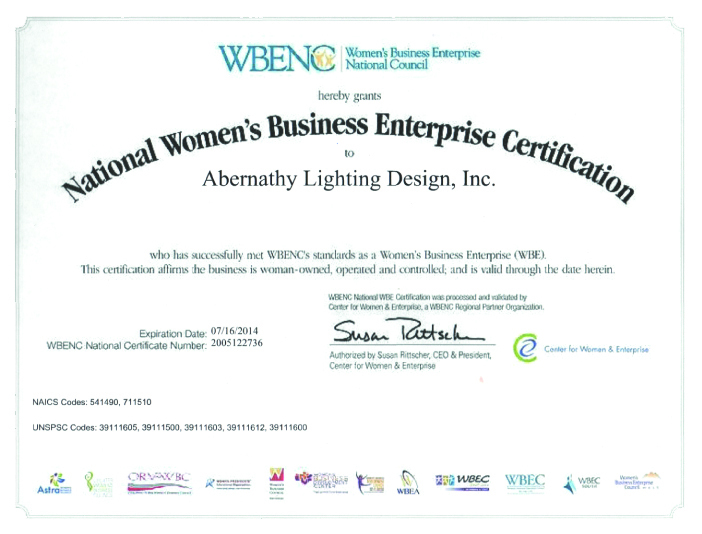 Abernathy Lighting Design was recently designated as a Women's Business Enterprise by the National Council. This means our WBE status is nationally recognized! Being a WBENC business allows ALD to make connections with other professional companies and increase our marketing reach to potential clients by making us a qualified option for their diversity standards/programs. The WBENC's national standard of certification (implemented by The Center for Women & Enterprise) is a meticulous process including an in-depth review of the business and on-site inspection. The certification process is designed to confirm the business is at least 51% owned, operated, and controlled by a woman or women. By including women-owned businesses among their vendors, corporations and government agencies demonstrate their commitment to fostering diversity and the continued development of their supplier/vendor diversity programs. Here is proof that a team that truly collaborates produces a fantastic project. ALD is honored to have been part of this Team! Join Abernathy Lighting Design as our second bridge is realized after 5 years of design, sweat and tears! Congrats to the entire Design team, it has truly been a terrific collaborative effort!